And then it finds, and downloads, 1013 items. This could take a while, but it doesn't need me to watch it. I've upgraded five more computers to gigabit ethernet, including Heavy. The problem with Heavy was that the three PCI slots were all being used by sata controller cards. I put a gigabit ethernet on a USB port, but that's not as good as a card inside the box. My plan was to get a sata controller card that would handle 8 or even 12 drives, and I've ordered that. But I had a thought today. Some of the motherboards I have, include five PCI slots. So I swapped the motherboard for one of those. The five slots have: video card, three sata cards, gigabit ethernet card. So it took an hour or so, but it all works, and now I have gigabit on most of the computers that I think will benefit from it. I've ordered five more gigabit cards; they're only £4 each. A program that I've been using for the last 20 years, didn't work on one of my new servers. On investigation, it didn't work on another one either. The problem was that these are both 64 bit servers, and I've installed 64 bit linux on them. The program was expecting to run on a 32 bit machine. So I googled. Unsurprisingly, no-one today has heard of the program, it's very obsolete. Except that it still does what I need. Fortunately, I kept the source code. With Linux, you can always download the source code. I put that onto the server and tried to compile it. Oops - no C compiler! So I downloaded the C compiler with "yum install gcc", and tried again. This time, it complained that it couldn't find the jpeg library. So I told it where that was, and then it complained that the jpeg library object code wasn't 64 bit. So I deleted all the object code and recompiled the jpeg library. That worked. And I tried to compile the program I needed - and that worked! That's one of the great things about linux. Even a 20 year old program can pretty easily be made to work. OK, now that I've understood the cause of my inner tube creeping round, I think I've worked out a way to fix it. The problem is that the outer tyre drags the innertube around when I brake. The solution that I'm going to try is ... talcum powder. I'll sprinkle it between the inner tube and the outer tyre. That should reduce the friction between the two, and maybe stop the creep. I've ordered 200 grams of Johnson's baby powder from Amazon. In my quest to upgrade Heavy to gigabit ethernet, I ran into a problem. To have the 15 drives in the box, I need to have one pata drive (the system drive) and 14 sata drives. There's two sata ports on the motherboard, so I needed to put in three four-port cards. But that uses up all three of the motherboard slots - no place to put a gigabit card. I'm currently using a USB-ethernet dongle, but that's not as fast as PCI ethernet. I got a card that takes one sata connection as input, and gives five sata ports as output. That would have solved the problem, except that this card only works if you have multiport capability on the port you're using to expand. Have I got that? I didn't know, so I got a card and tried it. And it didn't work. Back to the drawing board. Can I use a PCI slot doubler, to make two PCI slots out of one? Nice idea, but I don't think such a thing exists. Back to the drawing board. Then I thought - I've used 8-port sata cards (the 3ware Escalade). I have one in one of the big fast new servers, and I have another one in my spares box. Unfortunately, that other one doesn't work, I've tried it in a few machines. Back to the drawing board. Or rather, back to Ebay. Maybe I can buy another Escalade? And it turns out that you can get a 12 port Escalade for about £30. So I've ordered one. I should see it in a week or two. So here we are, a month after the referendum. Surely you didn't expect it all to happen immediately? So what is happening? I mean, apart from the fall in the pound? 1. Taking control of our borders. The biggest problem isn't refugees crossing the English Channel on Lilos or stowing away in lorries. That's never going to be volume. And immigration from non-EU countries, which was always about half of all immigration, won't be affected in the slightest by leaving the EU. But look at it from the point of view of someone who has made it from Syria into Germany, got asylum, is now in the EU, and can go anywhere they want within the EU, because of freedom of movement of labour. Well, Germany is kind of OK, but their beer is too fizzy. France is nice but french food? And Italians wave their arms about too much. No, what they really really want is to go to Britain, because that's the only place you can get a proper British Sausage. How are you going to get there? You can travel to the Republic of Ireland, because Ireland is EU. You can walk across the border to Northern Ireland, because there's zero border control, it's a totally open border. And now you're in the UK. Job done. Waitrose do great British Sausages. So are we going to close that border? I do not think so. Theresa May doesn't think so. Because that stops us from deporting criminals and putting people in prison unless we find them guilty in a court of law, which are petty rules that Theresa May wants to abolish. Or at least, she did until a few weeks ago, when she put herself up for PM, at which point she didn't want to drop the ECHR. So we'll keep that. And anyway, that's not an EU thing, it's a thing that we took a leading role in setting up just after World War Two. 3. Access to the European market. Would be nice. Would be very nice, especially if you want a prosperous UK. But to get it, we'll try to have that without the free movment of labour, which is like having your ice cream without eating your greens. Mutti Merkel isn't going to wear it, and nor will any of the other EU members. We can't just have the bits we want. We're trying to get a temporary exemption from the freedom of movement. We won't get it. 4. £350 million per week. Stop giggling. I know that was a mistake. Probably a typo. Maybe they meant £35 million, I don't know. But the fact is, we were paying a subscription to be a member of the club, because the fact is, the UK is one of the richer countries, and the idea is, and I know it's a revolutionary idea, is that the rich help the poor. So if we join the group of countries that does have access to the EU market, we'll be asked to pay a subscription, just like they do. The figure of, oh, I don't know, £350 million per week springs to mind, I don't know why. Probably a mistake. What a great slogan. It just leave me with a question ... what the hell do you mean? I had ordered, from Ebay, two 64gb memory cards for a couple of pounds each - this was before I knew about the problem of fake cards. They didn't arrive. Time went by, and after several weeks, and a week after the last date they should have arrived, I emailed the seller. The seller gave me an instant, full refund. Today, they arrived! So I tested them. They failed badly. After a couple of gigabytes, they bombed out. So even if they'd arrived on time, I would have asked for a refund. I really don't know how to solve this problem. The scum doing this scam are obviously profiting from it, or they wouldn't be doing it. So I guess that most people don't test their cards before giving positive feedback. I tried telling Ebay, but their response form doesn't have an option that is anywhere near "This is a fraud". Meanwhile, all I can suggest is, don't buy SD cards or thumb drives (same scam) on Ebay, unless it's from a vendor that you have a good reason to believe is honest. Because the Ebay "reputation" isn't working in this situation. Two problems surfaced during my last run. 1. I lifted the rear of the bike by lifting the saddle ... and the saddle broke. It was still usable, it was just the rubber bushes that damp the suspension that came apart. But it's still a broken saddle. So I replaced it, from the bike that I bought just for spare parts. At the same time, I remembered that daughter.1 had bought me a kind of saddle cushion. It isn't a saddle, it's a cushion that fits over the saddle, to make it softer. So I put that on, we'll see how it goes. 2. The inner tube rotates inside the tire, which makes the valve sit at an increasingly sharp angle. Eventually, this sheers off the valve, and the air escapes - this actually happened to me twice. I'd rather it didn't happen again. To deal with it, I deflate the tube, wiggle it straight, then reinflate it. But why does it happen, and why only the rear wheel? I was out caching yesterday, and I was idly thinking about this and that (caching gives me an opportunity to think deep thoughts) and I realised what's causing this, and why only the rear wheel. It's my custom to mostly use the rear brake for slowing down - that's because you're less likely to go into a catastrophic skid that way. The brake acts on the wheel rim, putting torque on it to slow me down, but the tire is still trying to continue on its way, as is the inner tube. And the differential between those forces, it what rotates the inner tube relative to the rim. So now I understand the cause, I can start to think of a more permanent solution than the deflate-adjust-inflate method. I went southwest today, down the M3 to Lockerley for a 45-cache circuit which I did on the bike. Parts of the route were very overgrown, and one track had two tree trunks fallen across - very difficult to get past. As a result, I'm well knackered, so much so that on the way home, I started getting cramp in my leg and had to stop to walk about a bit. 45 caches found, 1DNF (but I'm pretty sure that it's gone). I have a server where the main drive has recently started to become read-only, a few times per week. What causes that? There's probably several possible causes. I looked at /var/log/messages, which was a huge file, 92 megabytes. It's the system log. So I didn't read it line-by-line, I used grep, which roughly translates to "look for something". That told me exactly when it happened, so then I looked at the segment of the log at around that time, and it told me that the problem was a disk error on drive sdb. Linux couldn't write to the journal, so it remounted the drive as readonly. Which is a reasonable reaction, but it does leave me with a problem. 1) I've brought up another server, which is a copy of usula, and I've set up a cron job on it so that it's updated every two hours. That's in case I decided to retire usula. 2) I've set up a cron job on usula that greps the system log once per minute, and emails me if it finds "filesystem read-only", so at least I'll know very soon after it happens. I've bought a couple of USB gigabit ethernet adaptors now, one aimed at USB 3.0 and one aimed at 2.0. This turns out to be rather good. USB 2.0 runs at up to 480 mbit (although bus access constraints limit that to 280 mbit), so it should be helpful for an ethernet that feeds at 1000 mbit, although not as good as a PCI card. That's just as well, because most of my boxes run USB 2.0. These adaptors are useful for boxes that don't have a spare PCI slot (at the moment, that's only one box, the one called "Heavy") and for boxes that I want to temporarily boost from 100 mbit, but I don't want to mess around opening up the box and adding a card. But I have a plan for Heavy. Remember I ordered a SATA 1 to 5 port converter? I'll put that in Heavy, and that will free up a PCI slot; then I can put a gigabit ethernet card in. That will also be a good test of these converters; if it works well, I'll order a few. I've tested the USB - ethernet dongles with Fedora 17 and upwards, and the operating system detects them and uses them without me having to do much. My favourite printer is an HP Laserjet 6P. This wasn't the original Laserjet (I used one of those), but it's still pretty old. Noah didn't have one on his ark, but Moses used one to run off copies of the decalogue. Anyway, it's at least 20 years old, and I love it. I love it because it's reliable, it's simple, and I can buy a litre of toner ink for £10 and fill up the cartridge, which then lasts for years. It can take a great wodge of paper in the tray so I'm not forever filling it up. It has *never* gone wrong or let me down, and every operating system known to humanity knows how to drive it. But lately, the paper tray has been dificult to pull out for refills, and even more difficult to shoot back in. Just now, I checked the level of paper; it was half empty, so I filled it, and when I did that, I thought, how about easing the slide? So I got a fingernailful of Vaseline and smeared it in the runner grooves on both sides, and now it slides in and out like it's on ball bearings. Which I do, of course, four times per year. It's a fairly complicated process. Every time I make a sale to any of the 28 countries, I have to work out how much of that was for the service, and how much was VAT, because I charge a common price across all countries. But the VAT rates vary from 15% up to 27%, so I have to work backwards to the amounts. Then I add it up for each country, and fill in a form "VAT Moss" to tell HMRC how much I sold in each of the 27 countries (EU but not UK). The UK is done on a separate form. Until recently, the periods for UK and non-UK weren't synchronised, which caused no end of additional complications, but I worked out how to make them both cover the same periods, which helped. Of course, most of these calculations are automated, either in my billing system, or in spreadsheets that I've set up. So it's not too bad - I'm not complaining. Well, I am, but death and taxes are inevitable. But on Brexit, you can be sure that all this will change, and I'll have to rewrite my billing software, spreadsheets and other stuff. As will the millions of other small (and large) businesses in the UK. It's good to talk. But sometimes it isn't easy. Talking to TalkTalk is rarely easy. Company policy is - never call a customer back. I know that's company policy, because almost all TalkTalk staff conform to it. There's a couple of exceptions, but I think they're breaking the rules. I won't name them because A) I don't want to get them into troiuble with TalkTalk for being helpful and B) they're *MY* contacts, you find your own. I ordered something from TalkTalk in October 2014. Yes, getting on for two years ago. I'm still hoping. It got escalated from their Provisioning team to their Customer Escalations team. Then it got escalated to their Customer Escalations Escalations (thats not their real title, I forget what they're called) team. In May of 2016, I was told that the next time it would be looked at for planning would be September 2016. As you can guess, I made a lot of fuss about that. That's not a promise that I'd get anything in 09/2016, not even a promise that they'd start work then. Just a promise that they'd not even think about it until then. As per a suggestion from TalkTalk, I contacted my local council. Because according to TalkTalk, the problem was that it was taking months to get a "Road Traffic Order" (i.e., permission to go down a manhole in the middle of the road to see what's what). My local council referred this to the roads people, and the roads people were *very* unhappy that they were being blamed; they said they usually give permission within a day or two. Apparently, I'm not supposed to talk to the Council, the roads people or BTOR. I'm only supposed to talk to Talktalk, who are supposed to make stuff happen. So this bounced around a bit between the Council, the roads people, and BTOR (Openreach, the people who furnish the lines) until a missile was launched from all of them to TalkTalk. Talktalk responded by escalating the issue to The Office of the CEO. That sounds impressive, until you realise that this is just another bunch of overworked employees who get all the "Too difficult" stuff foisted on them. Still, Graeme Hughes at the Office of the CEO took on my case, and he was prodding BTOR. BTOR responded by sending a couple of men, including Kevin, to have a look at the situation. I welcomed them, gave them tea, and we talked. The original problem was the running the line South from here, had encountered insuperable blockages in the conduit. So in December 2015, they decided to go North from here. But in May 2016, they encountered insuperable blockages in that conduit, so considered laying a new conduit. But that would have to cross 11 driveways, and it isn't clear who owns the land - is it the council, or is it 11 property owners? And getting permission from 11 owners would be a big deal. "What about running it overhead?" I asked. It's only 500 meters, there's telephone poles all the way, and I know you can run fibre overhead because that's what Energis did countrywide. "Yes," said Kevin, "That's technically possible." He had a look at the 500 meters and said "There's a couple of trees overhanging two of the poles, they might have to be trimmed, but apart from that, yes." Then I got an email from Graeme to say that BTOR were going to replan taking the Southern route. And I had two concerns. A) does the person making this plan know that this has already been tried and rejected as infeasible, and B) what about the overhead route? So I emailed Graeme. No reply. So after a few days I phoned Graeme. And got a recorded message saying that he's left the company. So I emailed the Office of the CEO to ask who was picking up the issue. No reply. So I contacted one of the people I'd previously spoken to, one of the few people in TalkTalk who disobeys company policy and actually calls you back. I explained the issue to him - I currently don't have a contact taking over from Graeme. He tried to contact the Office of the CEO and got much the same result as I did. But he did give me another number at the Office of the CEO. So then I decide to go ballistic. I emailed Dido Harding at dido.harding@talktalkplc.com; she's the CEO, including the sentence "I know that when I was running a major UK software company (the Dr Solomon antvirus and computer security company), a situation like this would have been deeply embarrassing for me. I expect it's deeply embarrassing for you.". I posted on the TalkTalk facebook page. I Facebook-messaged TalkTalk. And I realised that the Office of the CEO has a range of phone numbers, being around 0333 003 1150 to 0333 003 1170 (and they might also stretch higher and lower). So I phoned these numbers one at a time - each one was on voicemail, so I left a message giving my number, a very brief explanation of the problem and a request to call back. Then I phoned "Customer support" and wasted an hour because they assumed I was "residential" without telling me that, couldn't find any trace of me except for an old AOL account (what?) at an address I left 10 years ago (and they asked me for confirm the postcode there, which I couldnt, of course). And eventually Darwin (after suggesting that I place the order all over again, to which I explained why that would be a very bad idea) escalated me to his manager, who was absolutely certain that there was no such thing as a 100 mbit ethernet link and I must mean broadband, and it was at that point that I realised that the people I was talking to were pure residential and the best they could offer was broadband. So she offered to transfer me to TalkTalk Business, then before she did so asked me if I was happy with the support I'd had, and obviously no I was not, and she asked why, and I explained why, and she said there was nothing she could do about it, and I said yes there is, would you like me to tell you what you can do about it, and she said yes, and I resisted the temptation to get obscene and suggested more staff training on the fact that TalkTalk also have business customers. So she transferred me to David. Obviously there's a zillion Davids in TalkTalk so I asked for his other name "in case we get cut off and I have to call back", which he wasn't allowed to give, so I asked for his employee number, and he said they don't have employee numbers "So we'd better not get cut off", he said, as if that was something that either of us could control. So I explained the problem, and he wasn't able to help, but he'd escalate this to his manager, who would get someone at the Office of the CEO to call me back by close of play tomorrow ("what about today?" I asked, but that's not possible). So I asked for the name of this manager, which he gave me, in full, so much for not disclosing people's full names, and asked that he call me back whether the OCEO calls me or not, because in TalkTalk there's another rule that says that as long as you can find someone else to dump a problem on, you don't have to check that anything happened. To be honest, that's a rule in most companies. So, continuing my campaign of "let's get some sort of answer from TalkTalk" I phoned the person at Customer Escalations Escalations that I'd been talking to before it was kicked up the OCEO. He wasn't there, but someone else was, and she told me that the OCEO has already emailed me. But I didn't get that email. So I asked what address it was sent to, and sure enough, they'd left off the last letter of the email address, sent it to .co instead of .com. So I got her to forward that email to my correct address, and at last I had a name in the OCEO who was supposed to be handling my case. So I phoned her. Voicemail. I left a message, hoping against hope that maybe she would be another of the rare people who flout the company policy of "never return a call". And I sat at my computer, googling for who else I could chivvy at Talktalk. And the phone rang! So now Jodie at OCEO is on my case, she agrees that the overhead route isn't being taken seriously enough, shares my concern that the Southern route has been tried and found wanting before, and is trying to get BTOR to escalate the issue to BTOR Escalations Escalations. Ellsa is another of my biggish servers, and I knew that there was a spare PCI slot, so I decided to upgrade ellsa to gigabit ethernet. Ellsa is running Fedora 17; although that's pretty old, it's not as ancient as some that I'm running (I started using Red Hat long before Fedora 1 came out). So, rather than install the latest Fedora, I decided to just stick the card in and work out how to install it. I put in the card, plugged in an ethernet cable and powered up. It worked. I didn't need to do a thing, and now ellsa has gigabit ethernet. Since I'm clearly moving to gigabit ethernet all over, I've ordered another 8-port switch, and a 16 port switch. Plus three more gigabit cards, and a couple of USB-to-gigabit converters, for those boxes that don't have spare PCI slots. New policy - two strikes and you're out. So many people repost stuff on Facebook that's blatant nonsense in the guise of fact. They aren't using their own critical thinking abilities, and they aren't fact-checking with Snopes, a good source for debunking false rumours. My policy from here on, will be to overlook *one* instance of reposting something egregiously wrong. The second time this happens, the person posting will be blocked from telling me stuff, because if you're passing something on, it's *your* responsibility to check whether it's nonsense *before* you post it. I'd encourage other people to do the same. So that people who post easily refuted false rumours will wind up with each other as their only audience. 10.1.2.3 is the (internal) IP address of the server I'm copying from. It failed so many times, I fell back on my old friend mirror.pl, but that wasn't really satisfactory, because rsync is much faster and better. I tried googling, but no-one seemed to have an answer for this. The real problem was that I didn't actually understand the problem. So I invested some time in trying to understand, without any luck - all I could see was "it isn't working". So I fell back on another tried and tested diagnostic. What did I change most recently? And the answer was, the gigabit ethernet switch. I had the from-server on a Netgear consumer-grade switch that I'd just bought, and the to-server on another one of the same. I wonder if that could be the problem? Although Netgear stuff is usually very good. "rsync error: error in rsync protocol data stream"
So I checked my own notes. Last time this happened, I added -e '/usr/bin/ssh' to the rsync command and that fixed it, so I'll try that now. Xappe was already running Fedora 24, so I didn't really want to reinstell Fedora. Plus, there wasn't a free PCI slot. But one of the slots was occupied by a sata port card that had only one sata drive attached. So I removed that card and put in a random gigabit ethernet card. Random meaning it was a brand I'd vaguely heard of, but it wasn't an Intel card. That left me with an unattached drive - no problem, I put on a sata-to-pata converter thing, and attached it to a pata connector. I wondered which of those two wouldn't work, the drive or the gigabit? I closed up the box and started up Fedora. It recognised the drive without blinking, I didn't need to do anything at all. And it recognised the gigabit ethernet card, giving it a different name from the onboard FE (fast ethernet, meaning 100 megabits). But it decided to use DHCP to control it, which isn't too surprising, because I hadn't told it anything about addressing. To change that, I tried to use system-config-network. But that wasn't on the computer - I should have thought of that before I started, and installed it using "yum install system-config-network.". So that meant I had to change the connection from dhcp to static by editing the config file. Fortunately, I know how to do that, and on reboot, I had a gigabit ethernet. There's a thing called ethtool that can confirm that for you with "ethtool eth0" or whatever the name of the connection is - you can find out using "route -n". So Xappe now has a gigabit ethernet, and I'm right now putting that to use by copying a terabyte to it, because one of the drives turned out to be failing, so I'm recopying the data on it, from a backup which is also on gigabit ethernet. Sweet! So now for the last of the big boxes. Heavy is running Fedora 17, with 14 two-terabyte drives (three four-port sata controllers plus two sata ports on the motherboard). And all those drives are in use, and pretty much full. So I decided not to downsize the server. It's been running reliably for six years now. But there were a couple of changes I wanted to make. The system drive was an 8gb CF card, connected to the pata port via a clever little adaptor. But that was 90% full, and that's more than I like. Also, I wanted to upgrade the box to gigabit ethernet. But there's no spare PCI slots. Nowhere to put a gigabit card. So the answer is a USB-gigabit dongle. It sits on a USB port, and gives me gigabit ethernet, if only I knew how to tell the server about it. So, two birds with one stone. I took out the 8gb CF card (which gives me a useful line of retreat if it all goes pear-shaped) and my box of bits yielded a 15gb SSD card with a sata interface. But all my sata interfaces are in use. Never mind; I have a clever little gizmo that connects to a pata port, and talks to a sata drive. I cobbled that together, and tried to install Fedora 24, because I know (from trying it out on another box) that Fedora 24 can autodetect the gigabit USB and make it work, without me having to tell it how. That's one of the great thngs about linux. With Windows, you're forever having to find and install drivers, and the drivers for one version of Windows don't always work on future versions. With linux, things just work. The installer takes a look around, works out what it'll need, and installs the necessary. Except it didn't. Fedora 24 wouldn't install. I got as far as the screen where it looks to see what drives are connected, and it sat there forever. Fedora 23 the same. Also Fedora 22. Fedora 21 had a somewhat different problem, but Fedora 20 installed just fine, autodetected everything and the gigabit ethernet worked. So, I thought, now we've got linux installed, let's upgrade to Fedora 24. And here's how. I didn't bother to backup all my data, because A) backing up 28 terabytes is a major pain, and B) I already have that backed up and C) there's nothing on the system drive, which is the one at risk, apart from my freshly installed Fedora 20. To tell it to upgrade to version 24, and to get whatever it needed from the internet. That almost worked. It lacked a signed GPG, so I told it --nogpgcheck and it almost worked. I had to yum update a couple of the packages, and then I had to reboot. Rebooting took *ages* because after it rebooted, it installed all the stuff it had downloaded. And then I rebooted again, and it was running Fedora 24! With gigabit ethernet! A few years ago, I built some very large servers. Large as in very big, and very heavy. They were so heavy that at one point, I had to buy a pump trolley to handle them, because I had a bit of a back problem. Even without the back problem, they're big and heavy. They're 5U in height, and they're built very solidly, of heavy gauge steel. Heavy. In fact, the last remaining monster server is actually called "heavy". Heavy has 14 2 terabyte drives, controlled by three 4-port sata controllers, plus two from the motherboard. Plus the system drive (which is a CF card with a pata interface). But today, I worked on giggi. Giggi is another server just as big and heavy as heavy, but four of the drives aren't in use just yet. And it occurred to me that if I took those out and put them in my spares box, that would leave 11 drives. The system drive runs from pata, there's two sata ports on the motherboard, so I'd only need two four-port sata controllers. And that leaves a spare PCI slot, which I can put a gigabit ethernet card into. I'm really liking the speed of gigabit. I remember when the best network speed I could get, was the 4 megabits of IBM's Token Ring, and that was good enough for our administrative stuff, but up in the data recovery workshop, we were slinging around 20mb at a time (megabytes, remember those?) so we installed a 10 megabit ethernet using a batch of ginormous ethernet cards that I got second hand from a shop that was the physical equivalent of Ebay, in 1989. And I also remember, several years later, upgrading from that 10 megabit ethernet to 100 megabits, and wow, wasn't that nice! So I heaved giggi onto my workbench and took out all the drives, the sata cards and the cables. Without all that, it's still a very, very heavy box! And then I installed the replacement, which I call giggj. As an aside, I usually do this. When I replace a server with one that's slightly different but has essentially the same function, I just change the last letter of the name. It reduces confusion, and is less of a burden on my weak memory. I've always had a weak memory. And I've always felt that this is a big plus; it means that more of my wetware is devoted to computation and less to memory, and I substitute for my poor memory by using bits of paper, and stuff on the computer. The problem that leaves me with, is I'm terrible at recognising faces. I tell people "all you humans look the same to me" and they think I'm joking. I put a Realtek gigabit ethernet card into giggj (£4 on Ebay) as well as the two sata cards. I put the drives in. The case I'm using for this has four slots that can take hard drives, another slot where the floppy drives would go, but who uses floppies these days, so I put another drive there, and a place where I can slide in a cooling frame that carries three drives and a fan. So that's eight drives. Where do I put the other three? I thought of using another three-drive cooling frame, but it would have just had to rattle around inside the box, and there wasn't really enough room for it anyway, plus a chance it would foul other things. So I thought outside the box. And I put that cooling frame outside the box. It's connected to the server via the three sata cables and a power cable, and it can sit on top of the server. This is just like the big fast servers I've been making recently. So I powered it up, and it worked first time. Even better, I'd cabled up the drives in the correct order, so I didn't have to change my mounting commands. So now I have a version of giggi that I can actually lift without risking a hernia, and which is connected via gigabit ethernet. To negotiate, there has to be two things. 1) something you want, but you're willing at least partially to give up and 2) a willingness to walk away from the deal. If you're not willing to walk away from the deal, if you absolutely have to have the deal then you can't really negotiate, because your oppo knows that you have to give in. We've put ourselves in that position. We can't threaten to leave, and we can't threaten to not leave. We're committed to leave, even before we pull article 50. And after we pull article 50, we're doubly committed to leave. The negotiation with the EU will be as big a sham as Cameron's pre-referendum negotiation. Of course, it will be presented as a success. "I hold in my hand a piece of paper" is a fine precedent. Another trip out to Essex - I did two segments. The first segment came to 30 caches, with one DNF. As I was hunting for this one, a ranger came by and asked me if I was geocaching. Yes I was. "It's been removed, it was on private land". Oh. I'll do a "Should be Archived". After I did the Essex Way caches, I did some Ancient Byway caches. As I was going along the byway, I came to a ford, so I speeded up and tried to splash through it. That didn't work, and I came to a halt in the middle of the ford. And it turned out that the ford was deeper than I'd thought, so I got two bootfuls of water, and wet feet for the rest of the morning. After I did those 30, I biked back to the car and had lunch, dried my feet, new socks, new boots, then drove to the second segment. That went well, and I didn't get wet. 57 caches done today, and a couple of DNFs. Hurrah, we have a government! That went faster than I thought - the plan was for the final run-off to be in September, but we have a government already. We have Boris at the Foreign Office; presumably he was shunted there because the only foreign relations that matter will be with A) the EU and B) Scotland, and he doesn't get to dabble in either of those. We still have Jeremy .... Hunt as Health Secretary, amidst a medical wailing and gnashing of teeth. Loathsome got the Environment, where hopefully she can't do too much harm. I was hoping for a dramatic cut in corporation tax, as promised by George, but I guess common sense prevailed and that won't happen. It was a nice thought while it lasted. Apparently businesses have been putting investment on hold while they wait to see how this will pan out. Not me, though! I've splurged over a hundred pounds on hardware, consisting of five Dell Poweredge servers that I got cheaply on Ebay. And I've topped that up with as much extra memory as I can stuff into them, a couple of gigabit ethernet switches so they can talk to each other at high speed, and assorted cables and interface cards. I've probably spent almost £200. So don't say that British Business isn't investing. So now it comes down to, how to sign up for the European Free Trade Area, to give us access to the single market. The problem won't be negotiating the terms, I can pretty much predict them. We'll need to agree to freedom of movement of goods, services, capital and labour. We'll need to ensure that goods and services supplied to EU countries conform to EU regulations. And we'll be asked to make a contribution to the EU budget. Basically, Norway only bigger. We'll try to get out of the free movement of labour, but the four are a bundle. It's all or none. And if we drop EU regulations, we'll have to write our own. For example, the much-loved regulation on straight bananas, if you actually read it, says that they have to be fit for human consumption. And just as eggs labelled "large" have to be above a certain size, so bananas labelled "First quality" have to meet certain criteria. If we rewrote that regulation, it would be pretty much the same as the EU one. And rewriting a zillion regulations isn't a task that our Civil Service eagerly wants. My guess at the contribution will start at £350 million per week, since we have that going spare after Brexit, but I'd guess there will be a bit of wiggle room on that. The difficult bit, will be to sell this package to the Brexiteers who are keen to "get our country back". The good thing about getting your country back, is that no-one really said what it means, so it could mean anything. Theresa May will need a good team of PR people to get the spin, song and dance right. I'd recommend Malcom Tucker - he was really good. You know that awful feeling when you can see that there's going to be an appalling tragedy and it's going to happen over the next couple of years, and everyone else knows it's going to happen, but no-one can do anything about it? And I'm not referring to the aftermath of Brexit when Theresa May presents us with a deal that retains freedom of labour movement, conformance with EU regulations plus a hefty membership subscription and pretends that somehow this is better than being a member of the EU and that her wonderful negotiating skills have made a silk purse out of this particular pig's ear. The PLP (Parliamentary Labour Party, which means all the Labour MPs) want to get rid of Corbyn. The reason doesn't much matter; I think they're expecting a mammoth defeat at the next election with him at the helm. So they staged a mutiny. A huge majority voted "no confidence" and most of the shadow cabinet resigned. So there's going to be another leadership election. Cunningly, they way the Labour Party has arranged this, the PLP has almost no say in it. The vote is all Labour Party members, and anyone with £3 to spare can sign up and vote. They thought they'd get rid of Corbyn because there wouldn't be enough PLP nominations for him to stand, but the party's National Executive Committee has ruled that he gets to stand anyway. And if he stands, he'll win. Leaving him with a party that's already rejected him. I can only see one way for this to go - the Labour party will split. Last time this happened, the Gang of Four (Shirley Williams, David Owen, Roy Jenkins and Bill "who?" Rodgers) set up the Social Democratic Party, which was going to "break the mold" but actually broke nothing, and sank without trace (well, almost, they're the "Dem" part of the Lib-dems). And I feel sure that the current PLP members are aware of the previous farrago. So what happens at the next election, due in 2020? Presumably all the mutineers will be made to walk the plank and a whole new set of Labour party MPs will be offered to the electorate, who will shout "Boaty McBoatface" at them and the Nasty Party will rule for ever. I can hardly wait for the next episode. I SMART-check my drives from time to time, in particular, I'm looking at the "Reallocated_Sector_Ct". When a drive realises that one of its sectors is failing, it reallocates a spare from its pool of spares. When that's just a few, it's no big deal, but eventually it climbs up to the hundreds, which is not good, and then the thousands, which is bad, and eventually the tens of thousands, and that's very bad. It's an easy thing to do. Here's my program that checks all the drives on a server. is looking well dodgy, and sdc not much better. Except that I did a scan three months ago and got the same numbers, so it isn't failing just yet. I've just upgraded Lenny to be one of my "big servers". Lenny is a Dell Poweredge 1550; a 1U box with 2gb of memory, twin Pentium 1266 processors running Fedora 24. So, not really big like the 64gb twin-xeon machine, but I only want it for a backup. For that to work, I needed to put in nine hard drives to bring it up to 18tb (I could do that with a couple of 8tbs and a 4, but I've got a load of 2tbs sitting doing nothing, so why waste them? The problem was, Lenny only has two PCI slots, and my usual 4-port Sata cards would therefore only support 8 drives. So I dug into my "box of bits" and got out an 8-port 3ware card that I last used a *long* time ago, and replaced one of the 4-ports with that. I put on the nine drives. How do you put nine drives in a 1U box designed to take at most two? You make up another 1U box containing a power supply, the nine drives and a plethora of fans, and lead the Sata cables out the back and into Lenny, using Sata extension cables (£1 each on Ebay) to give both the requisite length, and also an easy way to separate the boxes when I need to move them. That worked; Linux recognised the nine drives, and it's all being loaded up while I write this (over a gigabit ethernet link). I'm getting 42gb/hour. But when I ran my smart program, it didn't get any data from the drives on the 3ware controller. Here's what you do. Look at /dev, and you'll find a bunch of devices starting with tw. The first of those is twe0 on Lenny, and on Lenny, those represent sdg, sdh, sdi, sdj and sdk. Where N is 0, 1, 2, 3, 4. And that gives me the output I want. Drives sda and sdb are the SCSI drives that came with Lenny that I'm using as the system disks. And then I found another way to do all this. It's called a Sata port multiplier, and it turns one port into five! They cost £13, although having one means I don't need the five M-F extension cables, so the effective cost is £8. I've ordered one, to see how well it works. So now all of the prominent Brexiters have exited. Boris, Gove and now Leasom. I feel like Cameron has deposited a large mess on my doorstep, and all the people who actually helped to extrude the mess have now buggered off. Still, the good news is that A) the fall in the pound from $1.48 to $1.28 has increased my business income by 16%, and B) the fall in the stock market has now recovered. Commercial property prices are collapsing, but that doesn't affect me. So far, Brexit has been good for me, but I do feel sympathy for all the people who will be paying 16% more for food, fuel and clothing. Now that May is PM, at least stuff can happen. She was a Remainer, but is committed to Brexit since the referendum went that way. Here's my forecast. She'll try to negotiate with the EU. The EU will say "Sorry, not until you invoke Article 50". She'll try to negotiate with Germany and France. They'll say "Sorry, the EU rules say we can't make separate deals with you"
She'll try to do business with the British Commonwealth. They'll say "Sorry, you dumped is in 1973, since then we've developed other markets, we're not terribly interested in UK trade unless you offer us really really good terms. Plus, you're half a world away." So then (I'd guess some time in 2017) she'll invoke Article 50, and then she'll try to negotiate with the EU. The EU will say "You can join the single market, but only if you A) commit to free movement of labour, capital, goods and services and B) everything you send to the EU conforms with EU regulations and C) you pay a subscription (the sum of £350 million/week springs to mind). And we don't really have any leverage. So we'll accept those terms, with perhaps some wiggle room on the £350 million, which will give us almost a good a deal as we had pre-Brexit, and without the tiresome need to elect UK Members of the European Parliament to have a say in the direction of the EU. This will be presented as a great victory. The Brexiters will be happy because we've "got our country back", the Remainers will be happy because we'll only be a bit worse off than if we'd Remained, the Tories will crow about how well their negotiation went, the Labour party will celebrate by having another civil war, UKIP will crow about having succeeded in getting independence but will carp about that pesky "free movement of labour" bit, we'll have an election in 2020 and May will be PM until at least 2025. So that's all good, then. One of the cells in one of my 4s, 10AH batteries was down to 2.7 volts. That's bad; I usually run them down to 3.2, maybe 3.0 exceptionally. And when I tried to recharge it, it wouldn't recharge. I put it aside, and replaced it with a pair of 4s 5AH in parallel, but I didn't stop thinking about it. In the last week or so, I've got it back into action. What I did was balance the cells (which means discharging the cells that aren't the lowest voltage) and then charging, then balancing, then charging, and after a few iterations of this, I've got it back to 4.2 volts. I'll use it next time I go out, to see if it really is fixed. Our previous doctor is over-full, and since we're not in their area, they asked us to change practice. We got it down to two possibilities, and we visited them. One of them offered homeopathy, on a big noticeboard at the front listing their various services. You can guess which one we chose. I'm not going to be seen by a doctor who thinks that it's OK to do faith healing, sacrifice chickens or give me plain water as medicine. Or who allows their premises to be used by such quacks. A few hundred years ago, before democracy and the capitalist system, we lived in a political system called "Feudalism". The king was at the top of the heap, then the barons, then the lords, then assorted men-at-arms, freemen, vassals and villeins , and right at the bottom, were the serfs. A serf's duty was to labour for his lord. He couldn't go work for another lord. He was tied to his locality. By about 1500, feudalism was gone. People could work wherever they wanted - if one lord was offering poor terms and conditions, yuo could go work for another lord. Obviously, the lords weren't keen on this, but obviously the serfs liked it. The EU has four freedoms - the free movement of goods, capital, services and people. The free movement of labour is a fundamental freedom in every civilised country. You won't see restrictions on New Yorkers wishing to move to California. If we want to have a trading relationship with the EU, they will (among other requirements) insist on the free movement of labour. That's going to be non-negotiable. The people who thought that by leaving the EU we'd get control over immigration, are going to be just as disappointed by this, as they will be about the fact that in the past, we were not controlling immigration from outside the EU, even though we legally could have. And, by the way, immigration is the purview of the Home Secretary, who has been Thesesa May since 2010, and clearly didn't carry out David Cameron's pledge to reduce immigration to under 100,000 per year. Although my feeling is that she's the lesser of two evils. I back up the servers at my colocation in Cheltenham, to here. Sometimes, that means that I have to shift a *lot* of data, and my main line is only 2 megabits, which means about 0.9 gigabytes per hour. However. I also have three DSL lines, and they're fast for downloading; I get 6 to 8 megabits, which lets me backup at about three gigabytes/hour. But sometimes, even that isn't fast enough. Is there a way I can download using all three lines? Apparently not, unless I do something excessively clever called "bonding" using hardware I don't have, to combine the lines into a single channel. But I've found another way. I set up three computers to use the three DSL IP addresses as their gateways. That means that anything I download to those computers, comes down at the DSL speed of 3 gb/hour. But then, how to combine them? The answer is Samba. Let's call the computer that's receiving the backup BoxA, and the other three are BoxB, BoxC and BoxD. First, I need to run the Samba server on BoxA, sharing the directory that I'll be backing up to. Then I mount that directory on the three other boxes. I work out what stuff is going to need to be downloaded, and I set each of the three boxes to download different parts of that. This gives me a total of 9 gb/hour. Only four of the wires in the ethernet cable are used. The other four? There's two ways they can be used. You can use a "cable doubler" which lets you run two lots of data over the same cable. I can see that would be great when you've strung insufficient cables; it's cheaper than doing another lot of stringing. But I've never had a use for it; I always string more cables that I think I'm going to need. So, for example, when I linked the garage in Chartridge Grange with the utility room where I had the most important servers and where my outside lines came in, I strung four overhead cables instead of the one that I actually needed. Because cable is cheaper than doing another lot of restringing. I never used the other three. Recently, I read about POE, power over ethernet. I've known about this for a long time, but a light bulb went on in my head. In the Data Shed, there's a Raspberry Pi that gives me a GUI that lets me log in from there to anywhere (and it also does the in-house DNS, because all my internal computers have an IP that starts with 10.). That's powered by a power lead from one of my UPSes to a transformer that takes in 240 volts and gives out 17 volts, that goes through a step-down card to give 5.5 volts, and that goes to the Pi. It occurred to me that I could get rid of most of that. So I bought a pair of POE splitter adaptors, £1.24 on Ebay. I took 12 volts from the PC power supply that powers all the other Pies, put that through an ethernet cable, split it out at the Pi end, put it through the step-down card to get 5.5 volts, and the Pi powered up just fine. Then I thought, hmm, how about using that same ethernet cable to connect it to the network? But the little piece of ethernet cable on the adaptor wasn't long enough to reach to the ethernet switch. Hmmm. Then I remembered, a long long time ago, I bought ten female-female ethernet extenders. I used one of those, and two meters of ethernet, to connect to the switch. And it all works perfectly! I did two circuits today. The first was in a lovely forest, the Savernake Saunter; 18 caches plus a very old cache in the middle. Then I went north to Berwick to do a few more. After lunch, I went south to do a series of Pies. I found them all, and some of them were not easy. 39 caches done today on the bike. 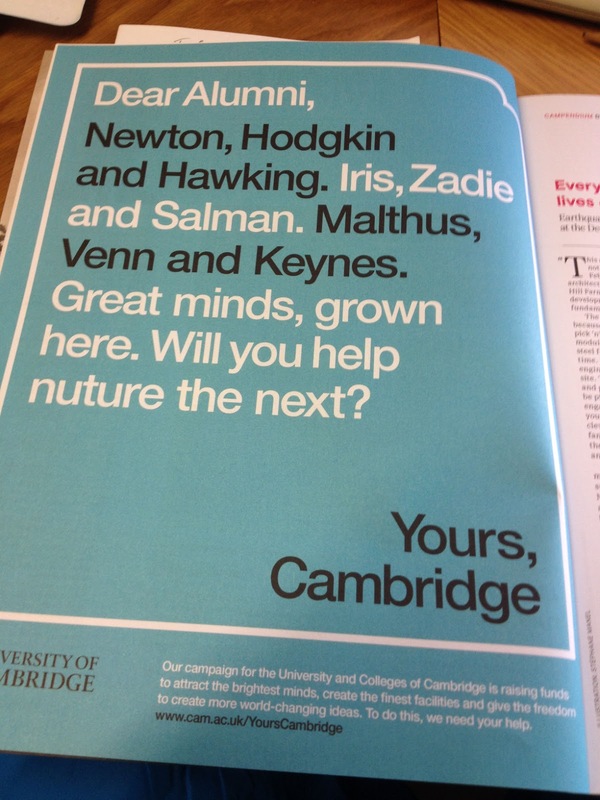 I get sent a magazine called "CAM", because I was there 50 years ago. The main thrust of the magazine is various intellectual articles, various adverts aimed at my demographic, and solicitation for donations. Above, you can see a solicitation for donations. 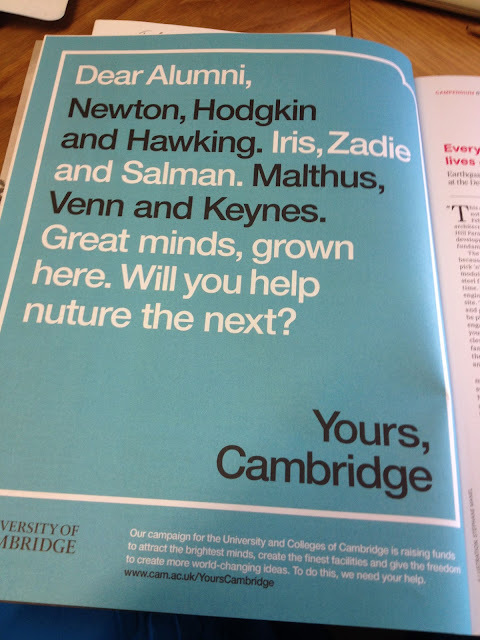 Since their selling point is that Cambridge nurtures great minds, you'd think they'd know how to spell. We just got letters from our doctor. "Due the pressure on our service of dealing with the demand from residents in and around Chesham ..."
Never mind about the bad grammar and ignorance of the difference between "due to" and "owing to", as long as my doctors know medicine, I don't mind if their written English is poor. The gist of the letter is that they're full up, we live outside their practice area (that's because we moved several years ago) and we have to register with another practice. There's a few possible reasons for this. 1) Too many people in their area, or 2) they can't recruit enough staff to cope, 3) austerity cuts mean they can't handle as much or 4) people are demanding more services. I don't actually know which it is. But if you're anti-immigration, you'd go for 1, if you're pro-immigration you'd go for 2. If you're anti-cuts you'd go for 3 and if you're pro-cuts you'd go for 4. The truth is probably a combination of the above. Oh well. I see my doctor so rarely, I never remember the name. Which is, of course, a good thing for me! So changing isn't a problem. With my move to gigabit ethernet (1000 megabits per second) I was impressed by being able to move 320 gb per hour. But most of my computers have 100 megabit ethernet. So I wondered if I could get a gigabit ethernet-to-USB converter. And of course you can. So I ordered one. It arrived today, and I tried it. It isn't gigabit, it's 100 megabit. It's a Realtek 10/100 device; that's what lsusb tells me. And when I install it and connect it to a gigabit switch, the gigabit switch tells me that it's connected at 100 megabits. So it's another Ebay scam, selling a 10/100 device as a 10/100/1000 device. It's only £2.99 (and I'm requesting a refund), but my guess is that the vendor gets away with this more often than not. I also reported it to Ebay, but their reporting system is very poor. Bye bye, Nigel. First Dave, then Boris, maybe Jeremy, now Nigel. Is there something about being a party political leader right now that's a bit of a hot potato? Theresa May said: “At the moment we are still a member of the EU and the arrangements still continue, so there is no change to their position currently but, of course, as part of the negotiations we will need to look at this question of people who are here in the UK from the EU." So Theresa May doesn't rule out the possibility of expelling some or all EU people? Some of those people have been here for many years, work here, have their family here and have made their life int the UK? This us disgraceful! She's the Home Seretary, and she should have said "No matter what the outcome of the negotiations, let me here and now state that there is no possibility of expelling existing people from the EU." Well, in the interest of balance, I'd like to say that I'm not ruling out the possibility of expelling Theresa May. I can, you know. There *will* be another election, in 2020 at the latest, and my memory is long. We have an Advertising Standards Authority, whose remit is to ensure that ads are legal, decent, honest and truthful. "before distributing or submitting a marketing communication for publication, marketers must hold documentary evidence to prove all claims, whether direct or implied, that are capable of objective substantiation"
If you make a claim, you should be able to show that it's true. But. I see so many advertising claims about god. How do they get away with that? And in relation to current events, "we do not have remit over non-broadcast ads where the purpose of the ad is to persuade voters in a local, national or international electoral referendum"
This is a huge, gaping hole, in an area of life more important than cosmetics or travel. Wouldn't it be great of politicians were held to the same standards that we apply to mascara? After Cameron/Johnson messed up the referendum (which should never have been held in the first place, it was only to stop the Tory party from splitting) and after the Labour party has become a haven for racists. After the Libdems broken promises made them a joke and with the Raving Looney Monster party being a shadow of its former self, who can a same person vote for at the next election. UKIP? I'd rather vote Looney. What happened to the country where a public racist rant was unthinkable, where people from Europe were welcomed as friends, where people weren't asked to wear safety pins to demonstrate their committment to decency, because you already knew that most people are decent, and those that aren't, keep it to themselves?